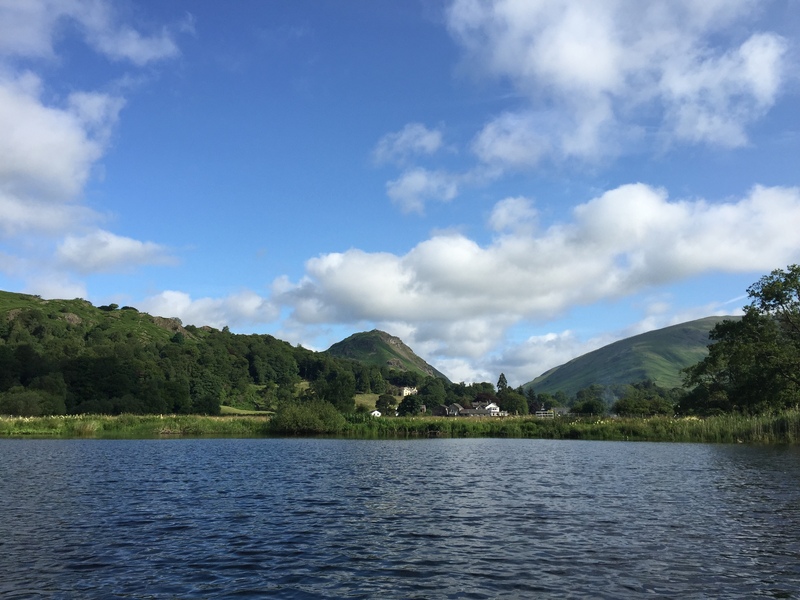 Lake District Life | Sharing my Lake District with others. Sharing my Lake District with others. Time has flown and another year of having no time to write my blog. We are now a UNESCO World Heritage Site. I have still had time to take lots of photographs so I would like to share what I have taken in 2018. Here is a quick trip round the region. It is easy to forget the obvious sometimes, and it was only because I had visitors staying who wanted a quick and simple walk with views, that I realised that I hadn’t written about Orrest Head. One of the claims to fame that Orrest Head has is that it is the subject of a chapter in Wainwright‘s The Outlying Fells of Lakeland, and the first fell he climbed. He describes it thus “our first ascent in Lakeland, our first sight of mountains in tumultuous array across glittering waters, our awakening to beauty” and also as “a fitting finale, too, to a life made happy by fellwandering”. Access to Orrest Head is just near Windermere Railway station and across the A591 via the pedestrian crossing where you will see this sign. 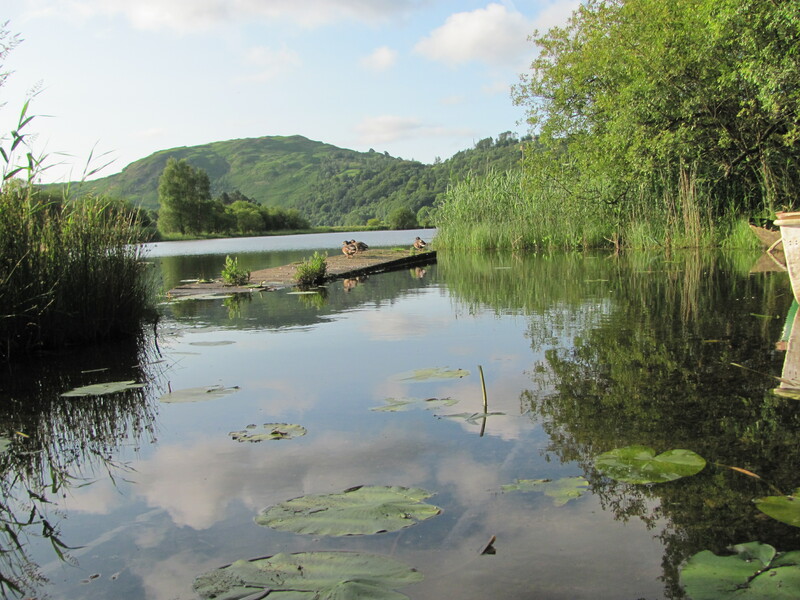 Both the woods you approach through (Elleray Woods), and Orrest Head are managed by Windermere Town Council and you may find a leaflet at the start of the walk which they produce. It gives a handy guide to wildlife you might spot on your way to the viewpoint. The wood covers an area of approximately 18 acres and was probably laid out in the 19th century. The area was originally owned by Arthur Henry Heywood and in 1902 his widow and daughter gave Orrest Head in trust to Windermere Urban District Council to be held for “public walks or pleasure grounds”. It is an easy walk on a metalled road to start with, then through the woods. At a leisurely pace about half an hour to the top. It is a busy little walk and when you reach the top you will find a stunning view of Windermere in all it’s glory. Don’t forget to look behind you too. Wondering what you are looking at? There is a handy guide to the surrounding fells. So if you have some spare time in Windermere I can highly recommend taking a detour to Orrest Head. Lots of view for little effort. One of these Summer days where you wake up and need an excuse to explore. It is raspberry time so I decided to find somewhere to pick my own rasps in Cumbria. A quick google brought up Rowley’s Raspberries in the Eden Valley. Great not been over that way for a while and a good excuse to visit Little Salkeld Watermill cafe which had changed hands since I was last there. Little Salkeld Watermill is an 18th Century watermill built in 1745 and houses an organic vegetarian cafe as well as producing flour. Situated near the stone circle, Long Meg and her Daughters this cafe was always a good stop off after a walk. I have written about both before. I was pleased to see the menu was still featuring homemade bread made with the flour from the mill. This was the selection I got with my delicious homemade soup. There is also a large selection of flour produced at the mill to buy. 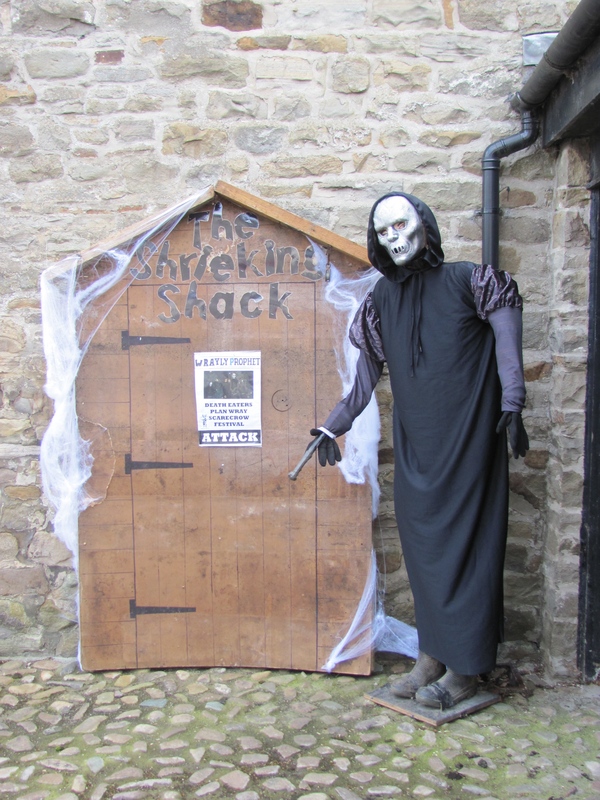 Self guided tours of the Mill were available for £2 adults £1 children. The mill has ample parking at the back with chickens running around and the mill race. Back to the matter at hand, time to pick some raspberries. The berry fields were situated just round the corner. Home and jam made, a productive day in every way. Well that is 2015 nearly gone. A year of challenges for many in Cumbria who have had to move out of flooded homes. Storms started to have names this year in the UK which has been slightly irritating. Frank has just been and gone causing more anxiety. Let’s hope for a gentler start to the new year. A more seasonal start to the year. Heading in to Keswick from Penrith on the way home (won’t be happening soon, as the A591 now has a Gap in it at the side of Thirlmere and it could take months to repair). It is the long way round now. Crisp clear days in February. Coming out of hibernation and visitors are starting to appear in the Lake District. Time for a visit to one of my favourite Lake District places. The Duddon Valley. Not a soul about. Perfect. A trip over Hardknott and Wrynose Pass is always a must before Summer really gets going. Daffodils which the Lake District is renown for on the way to Stockghyll Falls Ambleside. Time to buy some plants. Always a pleasure at Larch Cottage Nurseries. 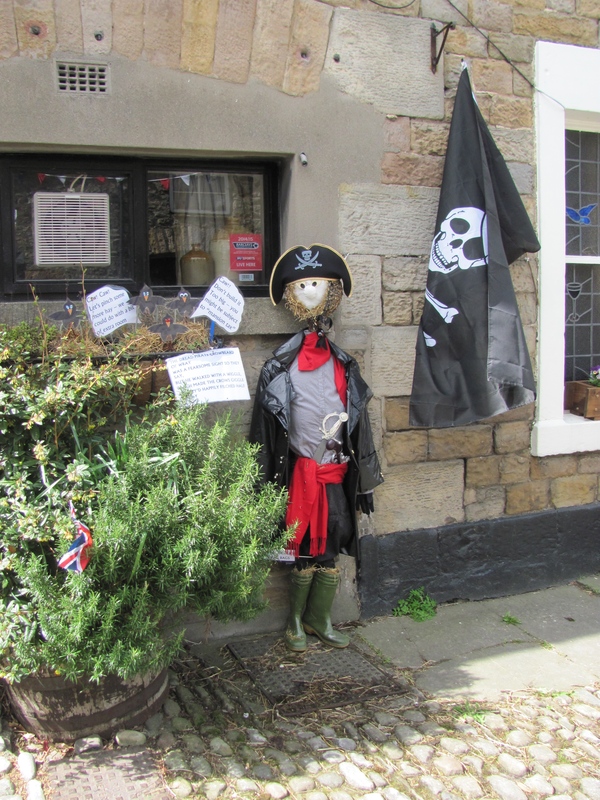 A delight to wander around with some really unusual items in the nursery and the shop. Blue sky at the end of May. This little beer garden is hidden away on the A591 (again on the other side of the “gap”) as I write this it is becoming apparent that until the road is fixed this blog will get very South Lakeland orientated. Sorry North Lakes I will make up for it as soon as I can! 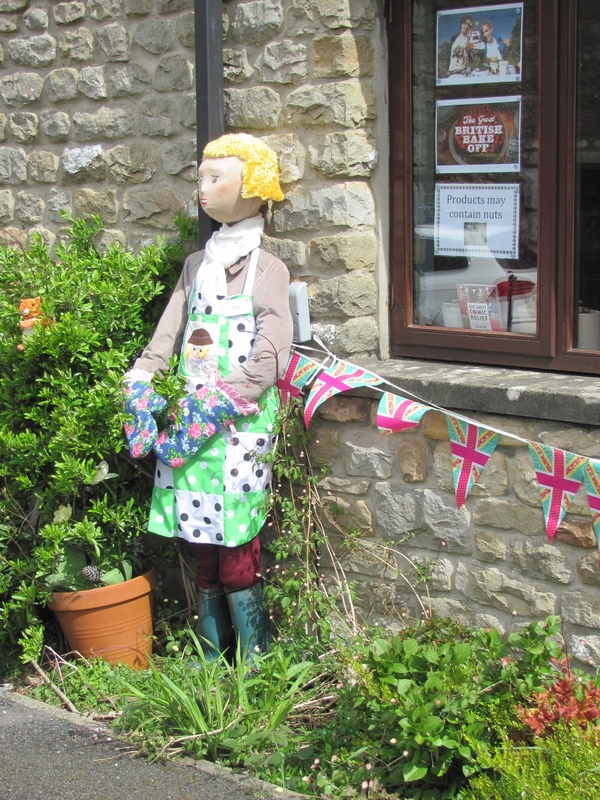 June brought Open Farm Sunday, a good excuse to visit Sizergh Farm and shop. Brilliant Cafe too. Spotted this marker stone in Cartmel showing the distance if you travelled over the Sands. Not something recommended without a guide. 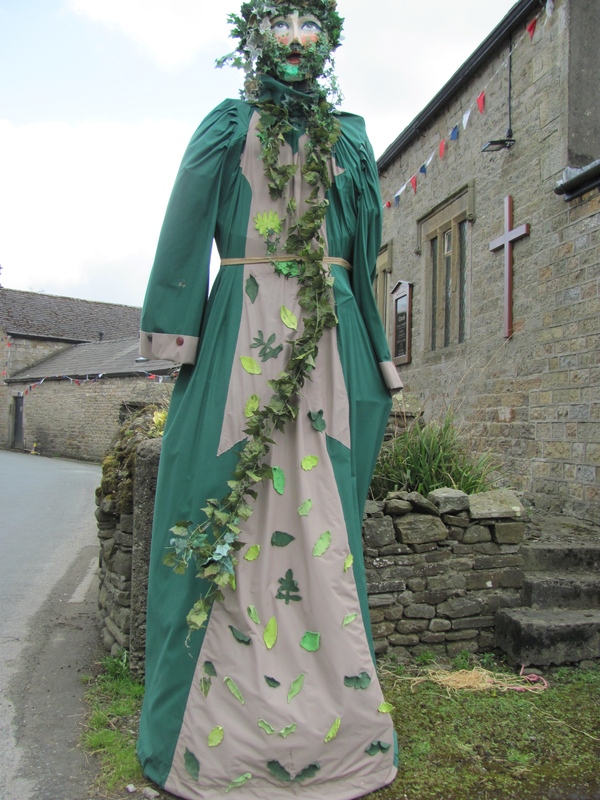 The weather in July made for a very pleasant theatre outing to Blackwell Arts and Crafts House. Love Chillis, Love Chillifest. Stocked up on everything Chilli in July. Interesting visit to the Bobbin Mill at Finsthwaite. Fascinating part of Lakeland heritage. Brougham Castle near Penrith with it’s workshops and cafe is always a popular stop off. September quite often brings great lighting like this at Lanercost Priory. And the view from Hardknott Fort is always worth a look. Great view on the way to Siskins cafe at Whinlatter. Hadn’t been to Lowther Castle for ages. Was great to see the work which had been done on the building and the grounds. 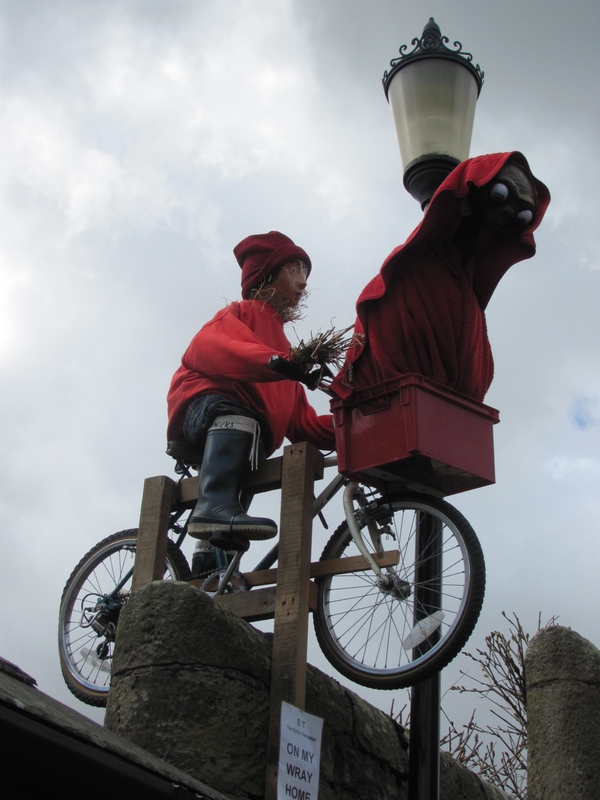 An unusual sighting of a Dalek in Kendal. Comicfest at it’s best. November brought stormy weather and when I went past Ullswater it was well over the road. Grasmere started to flood too in places it had never flooded before. Early morning in December in Grasmere. So that is my round up of a Lake District year. The bells are about to ring heralding the New Year. Here’s to a great 2016. 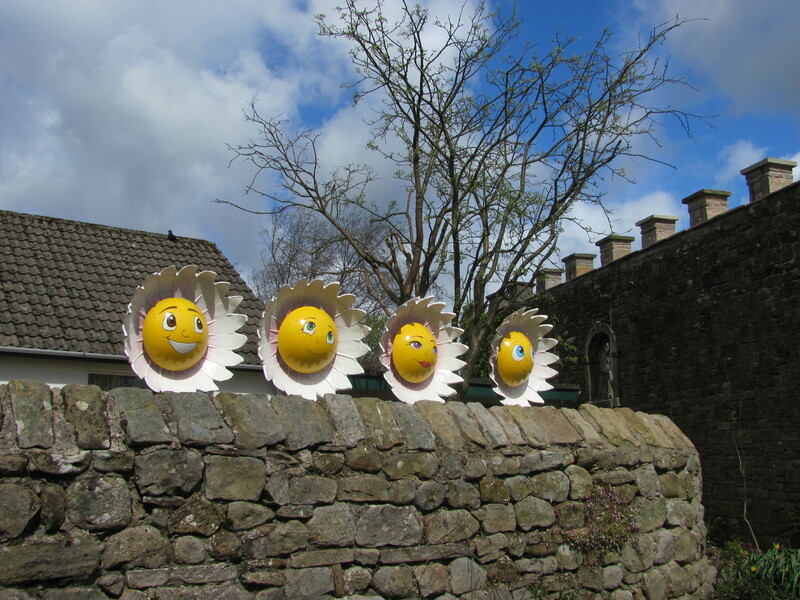 Well after a sustained spell of wet weather and flooding, the temperature plummeted and the morning of Ambleside Lantern Parade dawned crisp, bright and sunny. The village was buzzing all day as people sipped mulled wine, ate mince pies, did a bit of Christmas shopping and waited for the main event later in the day. The children, and some adults too, had a great time at the pop up ice rink down by the school. Even if you didn’t have a lantern for the parade you could still light things up with a neon novelty. Reindeers and Father Christmas led the procession, then came the lanterns in all shapes and sizes. Every shape and size imaginable. Young and old held their lanterns high as they reached the Market Place. Father Christmas switched on the Christmas Lights as he passed and the village became ablaze with lights. 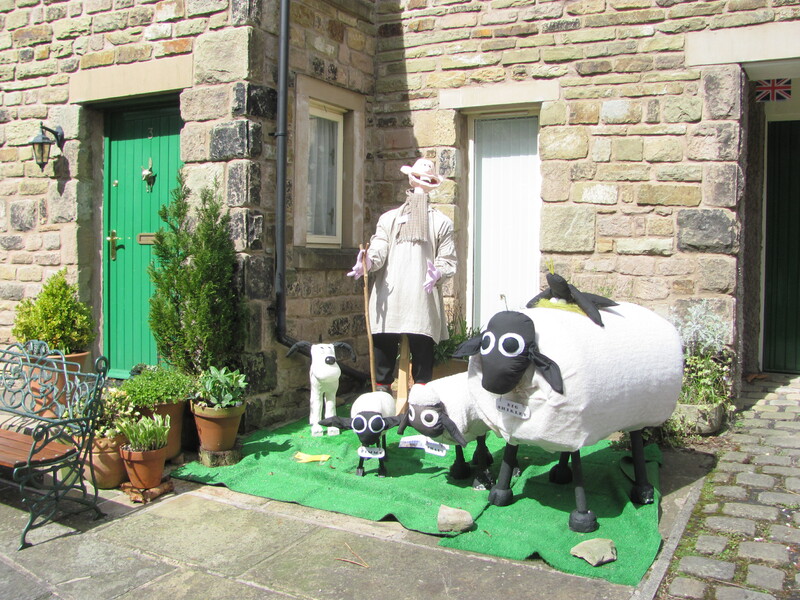 My favourite lantern was a herdwick sheep one. Round the village they paraded then down through the churchyard to the park. The park filled up with happy lantern bearers, villagers and visitors for the finale of the day. Fireworks on a perfect clear evening. Lantern poles were stuck in the ground while we waited. All of a sudden we were surrounded by a riot of noise and colour. What a finale to a perfect day. Congratulations to all involved in such a great event. Lots of time and hard work much appreciated judging by the comments all around. http://www.amblesidechristmaslights.co.uk if you fancy visiting next year. One of the delights of living in the Lake District is being able to head out early in the morning and enjoy the tranquility of the area before no one is about. 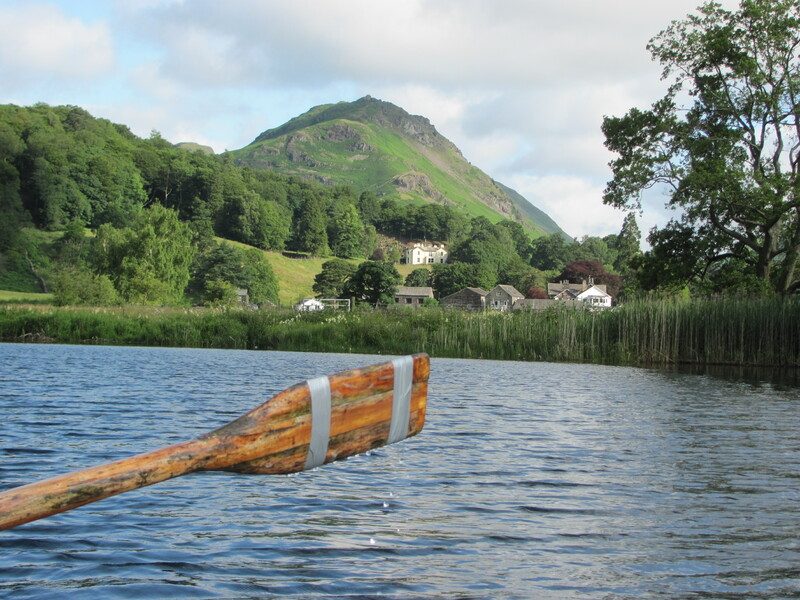 It was one such morning last week, time before work to go for a quick row on Grasmere. Only the ducks for company. Reflections on the lake are always beautiful but especially so at the start of the day, however the mere was a bit choppy. It was going to be a warm day, so a breeze was welcome. Allan Bank the National Trust property was standing out proudly at the head of the valley. Love the lily pads on the lake. 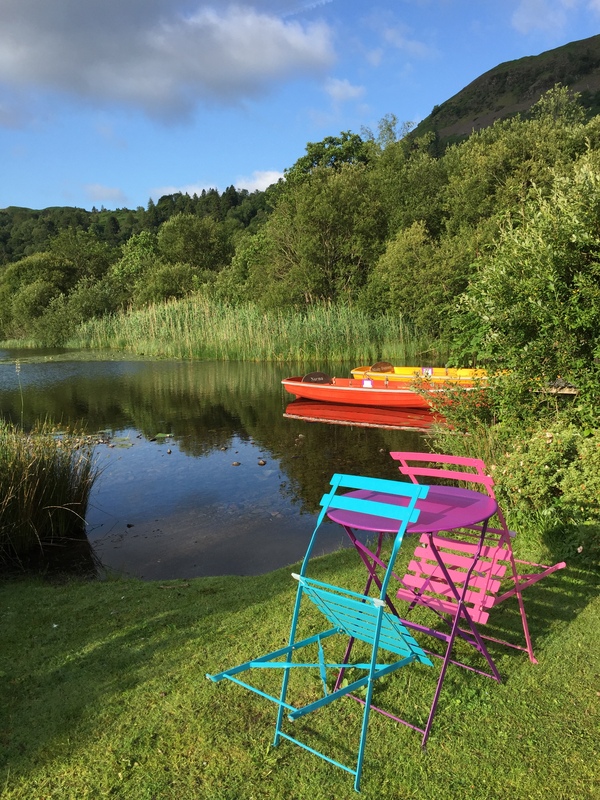 Fairyland rowing boats always give a splash of colour any time of the day. 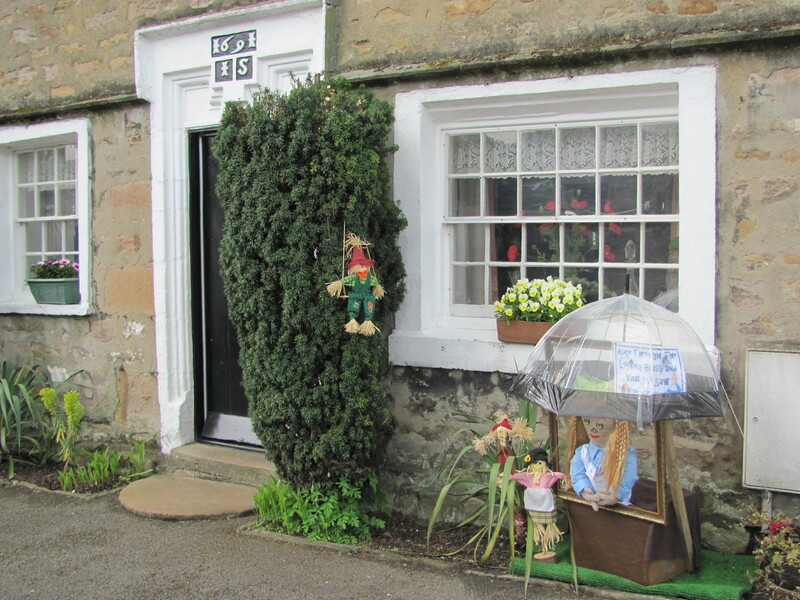 So back in to the village. 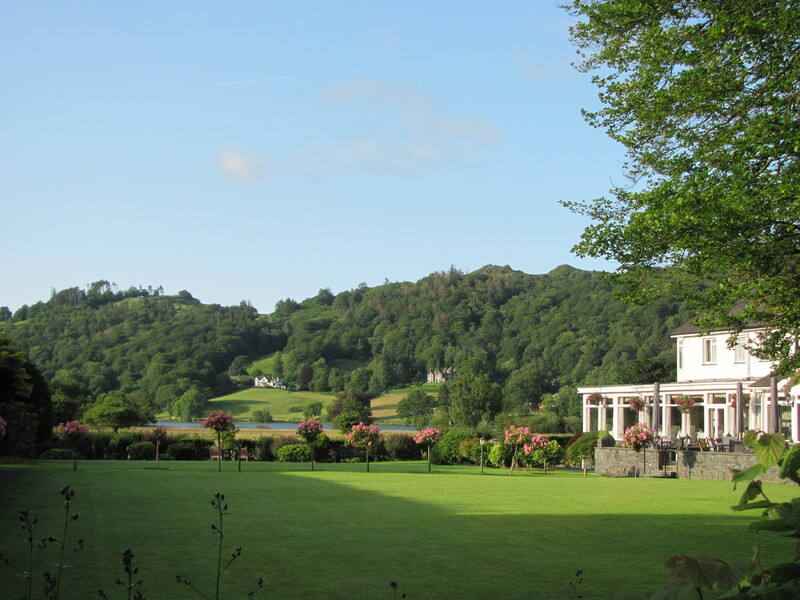 Was tempted to head in to the Grand @ Grasmere for breakfast it looked so inviting in the early morning sunshine. 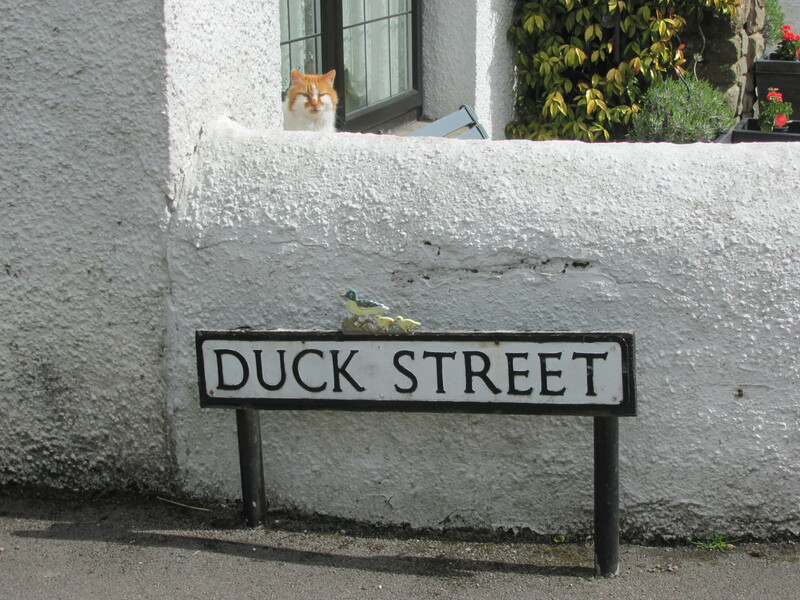 The centre of the village was still silent, preparing for the visitors to arrive, although the aroma of Grasmere Gingerbread was already in the air. 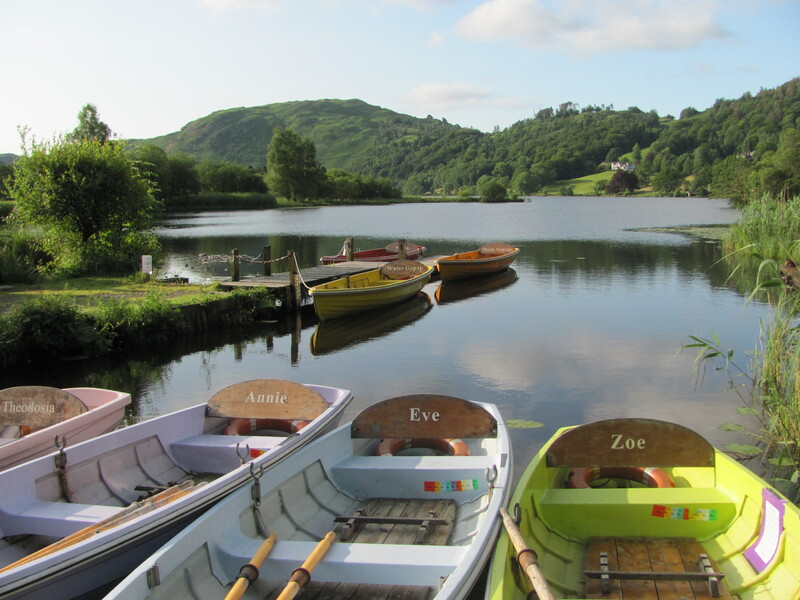 Another busy day in Grasmere ahead. Sometimes it pays to wander “over the border” to Lancashire. 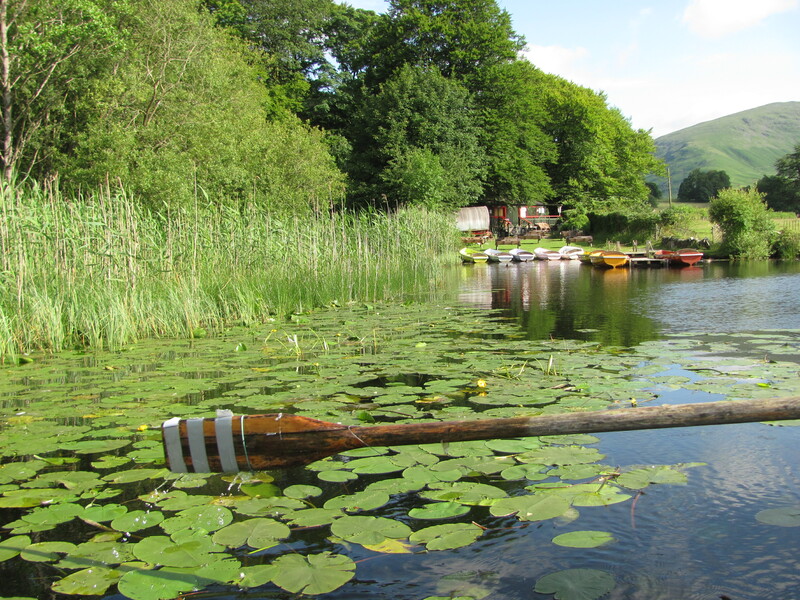 Many places are an easy day trip from the Lake District. As I had business in Lancaster I thought I would google “What’s on in Lancaster” before heading out. I am so glad I did. 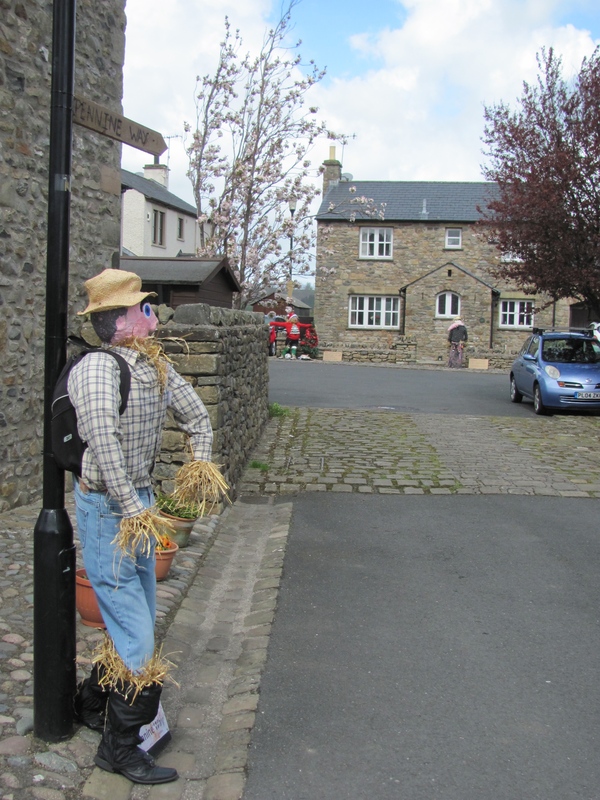 I spotted that there was a Scarecrow Festival in the village of Wray. 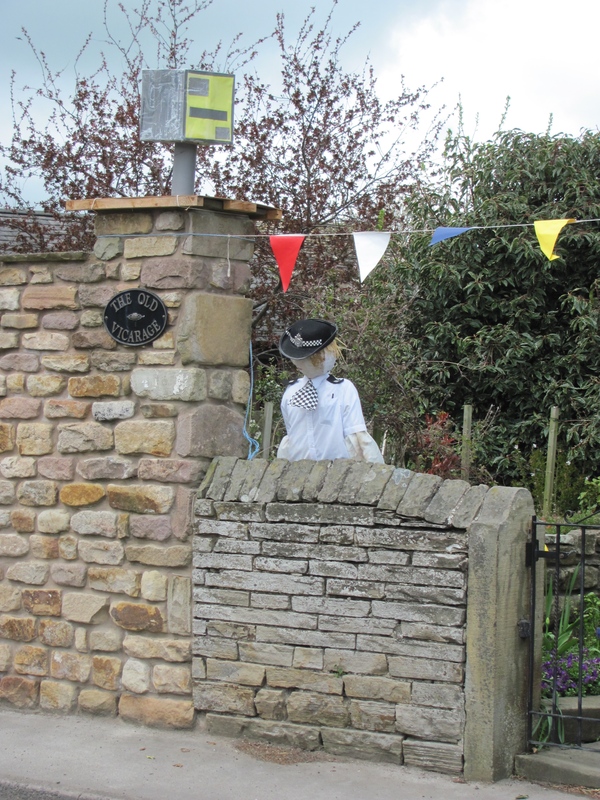 Wray village is situated in the Lune Valley and is an interesting little village with many buildings from the 17th and 18th Century. 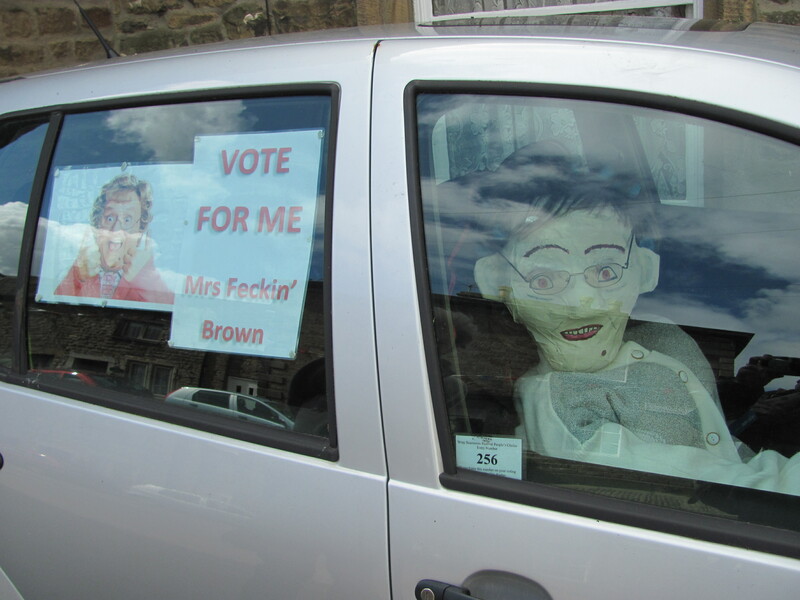 I was lucky enough to find a space in the church carpark. Put some money in the honesty box at the gate and headed in to the village. Local farmers do open their fields for parking. Usually £1.50 so don’t be worried about visiting. Remember to look all around. 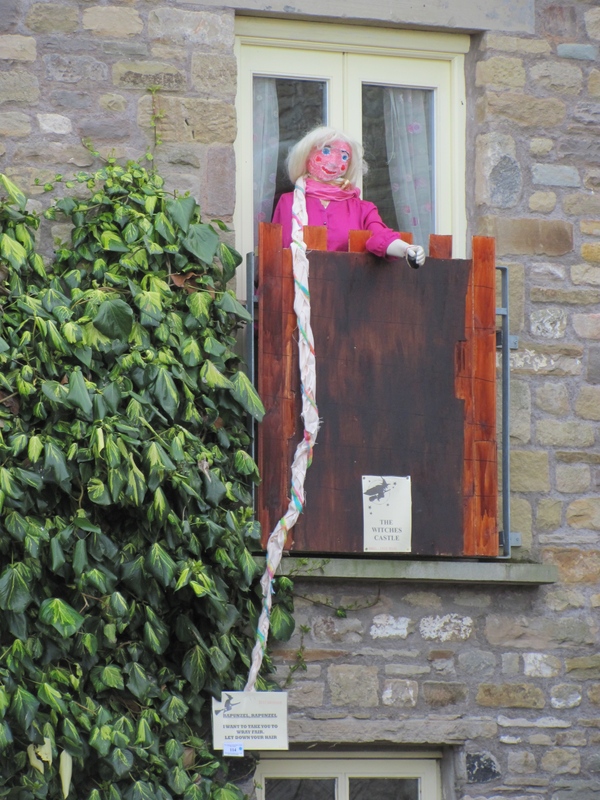 This scarecrow was perched high above. And make sure you even look inside cars! 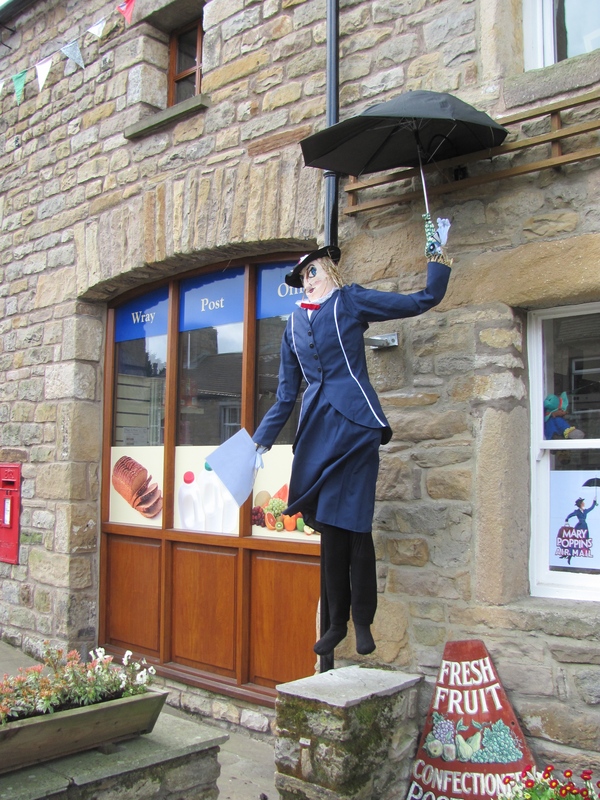 Wray used to be a village that produced hats, nails and bobbins. 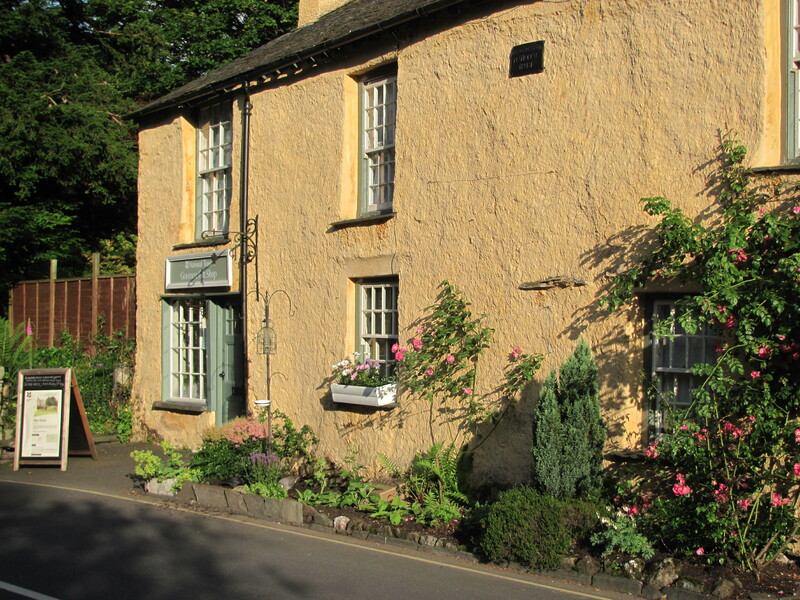 It is a lovely little village with a general store, Post Office and pub the George and Dragon. Everyone had taken part in the festival. The Locals seemed to be taking everything in their stride. 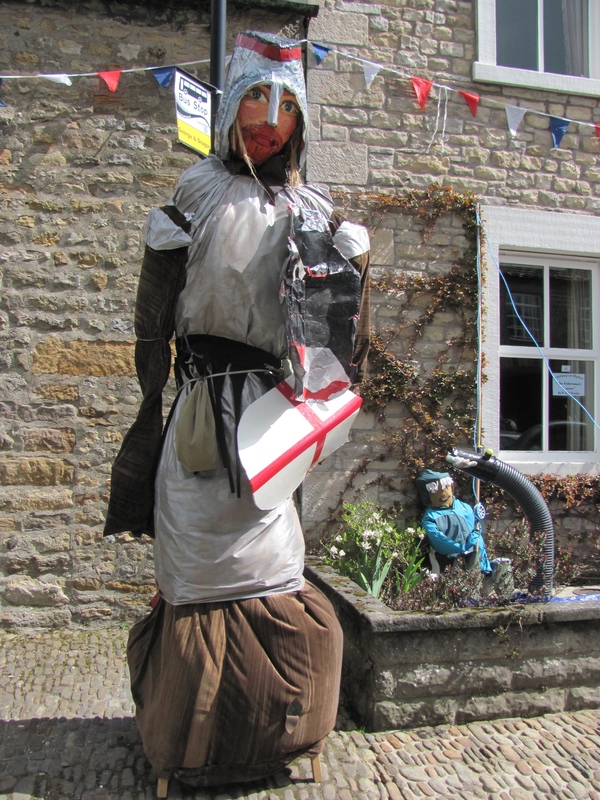 As well as the Scarecrow Festival which runs until the 4th of May there is a car boot sale, Vintage Market, and Fun Fair. 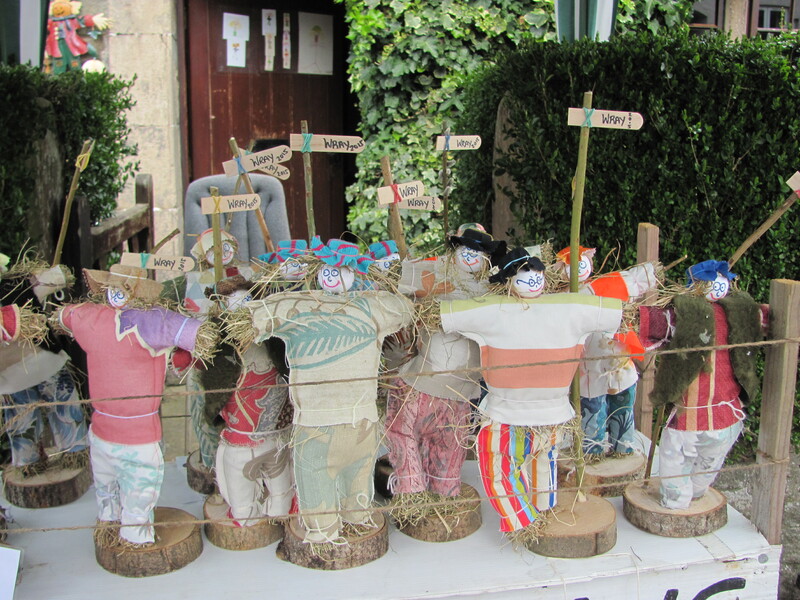 The school had made little scarecrows for sale. A bargain at £4 and a nice souvenir of the event. 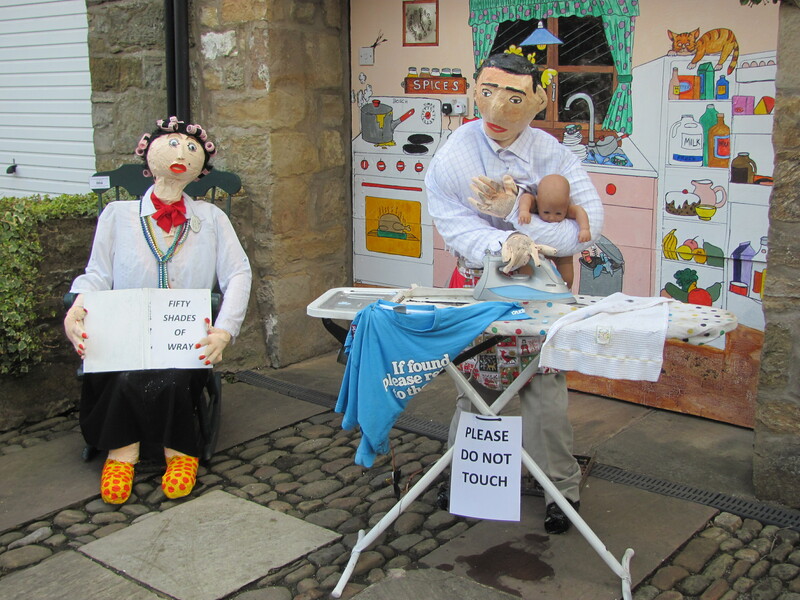 Loved this “Ideal husband” scarecrow especially the wife reading “50 Shades of Wray”! For more information about the Village of Wray http://www.Wrayvillage.co.uk and another interesting website http://www.Vrwray.com I will leave you with a few more images. A great day out from Cumbria. 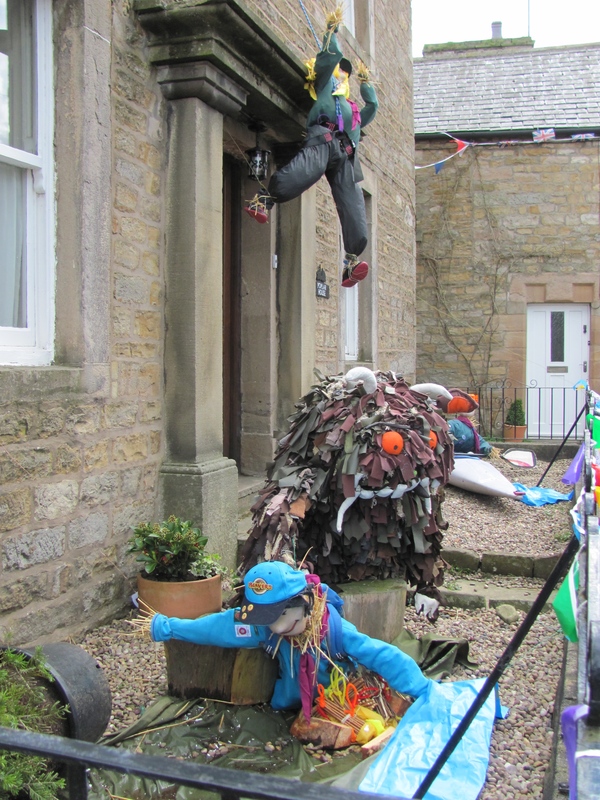 A Lovely Village and a great Festival. Well done to all involved.